For the 2018 race, see 2018 Preakness Stakes. The Preakness Stakes is an American flat thoroughbred horse race held on the third Saturday in May each year at Pimlico Race Course in Baltimore, Maryland. It is a Grade I race run over a distance of 9.5 furlongs (1 3⁄16 miles (1,900 m)) on dirt. Colts and geldings carry 126 pounds (57 kg); fillies 121 lb (55 kg). It is the second jewel of the Triple Crown, held two weeks after the Kentucky Derby and two or three weeks before the Belmont Stakes. "The Second Jewel of the Triple Crown"
First run in 1873, the Preakness Stakes was named by a former Maryland governor after a winning colt at Pimlico. The race has been termed "The Run for the Black-Eyed Susans" because a blanket of yellow flowers altered to resemble Maryland's state flower is placed across the withers of the winning colt or filly. Attendance at the Preakness Stakes ranks second in North America among equestrian events, only surpassed by the Kentucky Derby. The 143rd running of the Preakness Stakes took place on Saturday, May 19, 2018. Two years before the Kentucky Derby was run for the first time, Pimlico introduced its new stakes race for three-year-olds, the Preakness, during its first-ever spring race meet in 1873. 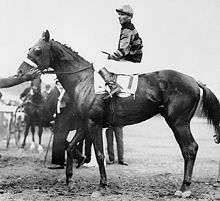 Then Maryland governor Oden Bowie named the then mile and one-half (2.41 km) race in honor of the colt Preakness from Milton Holbrook Sanford's Preakness Stud in Preakness, Wayne Township, New Jersey, who won the Dinner Party Stakes on the day Pimlico opened (October 25, 1870). The New Jersey name was said to have come from the Native American name Pra-qua-les ("Quail Woods") for the area. After Preakness won the Dinner Party Stakes, his jockey, Billy Hayward, untied a silk bag of gold coins that hung from a wire stretched across the track from the judges' stand. This was the supposed way that the "wire" at the finish line was introduced and how the awarding of "purse" money came to be. In reality, the term "purse", meaning prize money, had been in use for well over a century. The first Preakness, held on May 27, 1873, drew seven starters. John Chamberlain's three-year-old, Survivor, collected the $2,050 winning purse by galloping home easily by 10 lengths. This was the largest margin of victory until 2004, when Smarty Jones won by 11 1/2 lengths. In 1890 Morris Park Racecourse in the Bronx, New York hosted the Preakness Stakes. This race was run under handicap conditions, and the age restriction was lifted. The race was won by a five-year-old horse named Montague. After 1890, there was no race run for three years. For the 15 years from 1894 through 1908, the race was held at Gravesend Race Track on Coney Island, New York. In 1909 it returned to Pimlico. Seven editions of the Preakness Stakes have been run under handicap conditions, in which more accomplished or favored horses are assigned to carry heavier weight. It was first run under these conditions in 1890 and again in the years 1910-1915. During these years, the race was known as the Preakness Handicap. In March 2009 Magna Entertainment Corp., which owns Pimlico, filed for Chapter 11 bankruptcy thus throwing open the possibility the Stakes could move again. On April 13, 2009, the Maryland Legislature approved a plan to buy the Stakes and the Pimlico course if Magna Entertainment cannot find a buyer. Attendance at the Preakness Stakes ranks second in North America and usually surpasses the attendance of all other stakes races including the Belmont Stakes, the Breeders' Cup and the Kentucky Oaks. The attendance of the Preakness Stakes typically only trails the Kentucky Derby, for more information see American Thoroughbred Racing top Attended Events. In February 2017, the Maryland Stadium Authority released the first phase of a study saying that Pimlico needed $250 million in renovations. As of May 2017, no one showed interest in financing the work. The Stronach Group, owner of Pimlico Race Course and Laurel Park, was only interested in moving the Preakness Stakes to Laurel Park unless someone else financed work on Pimlico. The Preakness is the second leg in American thoroughbred racing's Triple Crown series and almost always attracts the Kentucky Derby winner, some of the other horses that ran in the Derby, and often a few horses that did not start in the Derby. The Preakness is ​1 3⁄16 miles, or ​9 1⁄2 furlongs (1.88km), compared to the Kentucky Derby, which is ​1 1⁄4 miles / 10 furlongs (2km). It is followed by the third leg, the Belmont Stakes, which is ​1 1⁄2 miles / 12 furlongs (2.4km). Since 1932, the order of Triple Crown races has the Kentucky Derby first, followed by the Preakness Stakes and then the Belmont Stakes. Prior to 1932, the Preakness was run before the Derby eleven times. On May 12, 1917, and again on May 13, 1922, the Preakness and the Derby were run on the same day. Today, the Preakness is run on the third Saturday in May, two weeks after the Kentucky Derby, and three weeks before the Belmont Stakes. Consequently, the race is run no earlier than May 15, and no later than May 21. Just after the horses for the Preakness are called to the post, the audience is invited to sing "Maryland, My Maryland", the official state song of Maryland. Traditionally, the Baltimore Colts' Marching Band led the song from the infield. Today, the United States Naval Academy Glee Club leads the song. As soon as the Preakness winner has been declared official, a painter climbs a ladder to the top of a replica of the Old Clubhouse cupola. The colors of the victorious owner's silks are applied on the jockey and horse that are part of the weather vane atop the infield structure. The practice began in 1909 when a horse and rider weather vane sat atop the old Members' Clubhouse, which was constructed when Pimlico opened in 1870. The Victorian building was destroyed by fire in June 1966. A replica of the old building's cupola was built to stand in the Preakness winner's circle in the infield. A blanket of yellow flowers daubed with black lacquer to recreate the appearance of a black-eyed Susan (see Winning) is placed around the winning horse's neck at this time, and a replica of the Woodlawn Vase is given to the winning horse's owner. Should that horse have also won the Kentucky Derby, speculation and excitement immediately begin to mount as to whether that horse will go on to win the Triple Crown of Thoroughbred Racing at the Belmont Stakes in June. In 1917, the first Woodlawn Vase was awarded to the Preakness winner, who was not allowed to keep it. Eventually a half-size reproduction of the trophy was given to winners to keep permanently. The original trophy is kept at the Baltimore Museum of Art and brought to the race each year under guard, for the winner's presentation ceremony. In 1940, it was proposed to drape the winning horse in a garland of the Maryland State flower, Rudbeckia hirta, commonly called black-eyed Susans. This posed a problem, as the race is run nearly two months before the flowers come into bloom in late June or July. At first, yellow Viking daisies were painted to resemble black-eyed Susans. Painted flowers have been discontinued since the first decade of the current millennium and viking poms, a member of the chrysanthemum family, are now used. Although the Preakness is sometimes referred to as "the race for the black-eyed Susans", no black-eyed Susan is ever used. In 1918, 26 horses entered the race, and it was run in two divisions, providing for two winners that year. Currently, the race is limited to 14 horses. In 1948, the Preakness was televised for the first time by CBS. At its inauguration in 1873, the Preakness carried a value of $1,000. The first major increase occurred in 1919 when the race had a $25,000 value. It climbed to $100,000 in 1946 and in 1959 was raised to $150,000. Subsequent increases occurred from 1979 to 1989, when the purse rose four times from $200,000 to $500,000, before going to $1 million in 1997. On December 12, 2013, the Maryland Jockey Club announced for the 2014 running of the Preakness the purse would be increased from $1,000,000 to $1,500,000. The race has had something of a party atmosphere in the past, especially in the infield, which is general admission. The course had a "bring your own booze" policy until 2009, formerly including kegs of beer but in the 2000s restricted to all the beer cans a person could carry in a cooler. However, despite crowds in excess of 100,000, the BYOB policy was canceled in 2009 after videos of intoxicated people running along the tops of lines of portable toilets while being pelted by beer cans reached a large audience. In 2009, with the alcohol ban, race attendance dropped to 77,850 after topping 100,000 for eight consecutive years. In 2010, and the Maryland Jockey Club responded with a new event called "InfieldFest" with performances by musical acts, the "Mug Club", which included an infield ticket and an unlimited-refill beer mug, and a mascot named "Kegasus", a play on keg and pegasus (though actually a centaur). The much-derided Kegasus was retired in 2013. In 2010, ticket sales had recovered to 95,760 and have since stayed high. Aside from InfieldFest, the race is known for its fancy hats and official cocktail, the Black-eyed Susan, made with vodka, St-Germain liqueur and pineapple, lime and orange juices. Secretariat, the 1973 winner (and ultimately Triple Crown winner) was originally credited with a running time of 1:55. Two Daily Racing Form clockers, however, had timed Secretariat's Preakness in 1:53 ​2⁄5, which would be a new stakes record. A hearing was held over the time discrepancy, where a video replay showed Secretariat reached the wire faster than Canonero II, the then-current record holder, but instead of giving Secretariat the record, the Maryland Jockey Club decided to split the difference and make its official time that of Pimlico's clocker, who had timed the race in 1:54 ​2⁄5. The matter was finally resolved in June 2012, when a meeting of the Maryland Racing Commission unanimously ruled to change Secretariat's final time to 1:53 based on testimony and analysis of the race replays. Consequently, Secretariat holds the current official record for all three Triple Crown races. Note: Timed to ​1⁄4 second 1873 to 1899, to ​1⁄5 second 1900 to 2002, to 0.01 second since 2003. § D. Wayne Lukas swept the 1995 Triple Crown with two different horses. ^ "Preakness Stakes - Preakness Origins". preakness-stakes.info. Archived from the original on 2 May 2015. Retrieved 18 May 2015. ^ Dandrea, Phil (2010). Sham: Great Was Second Best. Acanthus Publishing. ISBN 978-0-9842173-3-5. ^ Pick, William; Johnson, R. (1803). The Turf Register (Volume I). A. Bartholoman, High-Ousegate. ^ Rogers, Mike. "History Fills Old Hilltop", PressBox (Baltimore), April 2009. ^ "Preakness Stakes - History". preakness-stakes.info. Archived from the original on 13 April 2015. Retrieved 18 May 2015. ^ "Md. legislators OK billon buying Preakness Stakes". The Courier-Journal. Retrieved 18 May 2015. ^ Walker, Childs (May 17, 2017). "Preakness 2017: Shifting the Preakness from Pimlico to Laurel Park might not be such a long shot". The Baltimore Sun. Retrieved June 1, 2017. ^ Turf'n'Sport Archived 2011-04-29 at the Wayback Machine, Retrieved on 2009-05-04. ^ Rodricks, Dan. "Just one serse of state song to be aired". The Baltimore Sun. Retrieved September 30, 2014. ^ Brunelli, Laureen Miles. "Maryland, My Maryland". Retrieved September 30, 2014. ^ "Preakness Stakes - Weather Vane". preakness-stakes.info. Retrieved 18 May 2015. ^ "Preakness Stakes - Black Eyed Susan". preakness-stakes.info. Retrieved 18 May 2015. ^ "Preakness Stakes - Woodlawn Vase". preakness-stakes.info. Retrieved 18 May 2015. ^ Reimer, Susan. "Neither Susans nor daisies", The Baltimore Sun, Friday, May 16, 2014. ^ David Klatt, The Secret Behind the Preakness' Black-Eyed Susan Blanket May 14, 2009. ^ The Black-Eyed Susan Blanket. Accessed 2009.05.14. ^ a b "Preakness purse increased to $1.5 million - Handicappers' Edge". brisnet.com. Retrieved 18 May 2015. ^ a b Mihoces, Gary. "Preakness Stakes mascot Kegasus defends image". USA Today, May 16, 2011. Retrieved on May 18, 2011. ^ "A guide to attending the 139th Preakness" Washington Post, May 13, 2014. ^ Haskin, Steve. "Viva Big Red!". cs.bloodhorse.com. Retrieved 17 July 2016. ^ "Site Index". CBSSports.com. 2008-06-11. Retrieved 2012-05-08. ^ Durso, Joseph (11 June 1995). "Thunder Gulch, Only No. 2, Brings Lukas a Triple". The New York Times. Retrieved 17 July 2016. Ten Things You Should Know About the Preakness at Hello Race Fans! Wikimedia Commons has media related to Preakness Stakes.